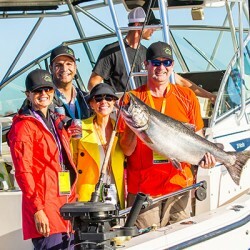 Pacific Angler offers fully guided BC fishing charters including Vancouver area fishing adventures. Pacific Angler Fishing Charters was started because we are passionate about fish and introducing people to Vancouver salmon fishing! The only thing we like more than catching fish ourselves is helping other people catch fish. There is something about the smile on someone’s face when they catch their first BC salmon, or when they see their first seal, or bald eagle or whale, or the way they stare up at the snow capped mountains in awe. Therein in truly lies the joy of fishing and guiding itself, the catching is just a small part of it, but the journey, the experience, and the friendships gained along the way are what truly make it special. At Pacific Angler we also believe in good old fashion customer service. We are here for you from the minute you pick up the phone to book your trip to the moment you return home with your catch. Our crew consists of some of the best salmon fishing guides in Vancouver. These are friendly, hard working guides who are passionate about providing you the ultimate Vancouver salmon fishing trip. Our goal and our passion at Pacific Angler is not only to catch you a lot of salmon, but to surpass all of your expectations in the process. "Thanks again for putting together such a great trip yesterday! You did a great job. The guys couldn't stop talking about it all the way home.....and then I received full page emails this morning telling me what I great time they had. We had the ultimate crab feast last night....seriously amazing! We will definitely be doing many more charters with you guys. - Cheers!!!" "I just wanted to thank you again for taking us out on such a great fishing trip on Saturday. All of us had a blast! To catch 3 species of salmon and a bunch of other saltwater fish was awesome! Thanks for the great day and allowing us to stay out on the water longer than the usual 8 hours. The barbecue we had with pink salmon, coho salmon, and Chinook salmon was delicious. This was a weekend that we will all remember for a long time."